Baruch College, an ITA Strategic Partner, is empowering its students and solving real-world business problems through an innovative program with ITA’s U.S. Export Assistance Center (USEAC) in New York City. Students in Professor Rajeev Sawant’s capstone class in the undergraduate international business major have an opportunity to assist local businesses that are clients of the USEAC with their strategy for entering international markets. As part of their capstone class, the students work on a real-life case applying their theoretical learning to help a local company go global. This ‘live case’ method of teaching has provided practical help to real companies in NYC. One company, Beauty Solutions, asked the students to identify the most promising new export markets for its lipstick brand. The students researched various markets, analyzing the level of interest in U.S. products, the stability of the local currency, and the percentage of shopping done via television, as well as other factors. The students developed a methodology to rank the researched markets and presented their findings to Jerry Rauchwerger, the President of Beauty Solutions and a Baruch alum, at the conclusion of the course. Beauty Solutions found tremendous value in the students’ advice, and is utilizing their recommendations in planning its international marketing strategy. The capstone program has provided actionable market insights to other businesses in the NYC area – and even generated employment opportunities for some enterprising students! The students also supported ITA and Baruch last week during World Trade Week NYC. ITA Strategic Partners like Baruch College provide critical linkages between ITA and U.S. businesses, helping us to reach more exporters and arm them with the information they need to succeed in today’s globally competitive marketplace. ITA’s mission to strengthen the competitiveness of U.S. industry and promote trade and investment strengthens the U.S. economy, supports U.S. jobs, and fosters long-term, sustainable growth. How Are Escrow Services Used In International Trade Transactions? Andrew K. Sokol is General Manager of Emerging Markets at Escrow.com, an International Trade Administration Strategic Partner. The Trade Finance Guide is a helpful guide about the basics of trade finance. The question is…what is an escrow service and how is it used in international trade transactions? The International Trade Administration’s Trade Finance Guide (TFG) says an escrow service is a cash-in-advance option available to exporters and importers that reduces the potential risk of fraud. It acts as a trusted third party that collects, holds and disburses funds according to exporter and importer instructions. Here’s how it works: the importer sends the agreed purchase amount to the escrow service. After payment is verified, the exporter is instructed to ship the goods. Upon delivery, the importer has a pre-determined amount of time to inspect and accept the goods. Once accepted, the funds are released by the escrow service to the exporter. The escrow fee can either be paid in full by one party or split evenly between the exporter and the importer. The TFG also points out that, as an exporter, any sale is a gift until payment is received. And, because getting paid in full and on time is the ultimate goal for the seller in each sale, an appropriate payment method must be chosen carefully to minimize the payment risk while also accommodating the needs of the buyer. The Trade Finance Guide shows how some payment methods are more secure than others, depending on whether you are an importer or an exporter. In other words, escrow services can offer a mutually beneficial cash-in-advance method for both parties. Plus, offering escrow services as a method of payment can actually add potential importers to U.S. exporters. In many cases, deals just don’t happen due to a payment related “issue” – and one example might be that you, as the exporter, require payment in full and up-front but the importer is reluctant to send the money until they receive the goods. In this case, by offering escrow services, both parties can be satisfied, the payment issue is resolved, and the deal closes. Cross-border escrow services are offered by international banks and firms that specialize in escrow and other deposit and custody services. The Internet Crime Complaint Center – a partnership between the FBI and the NWC3 (National White Collar Crime Center) to prevent fraud: http://www.ic3.gov/crimeschemes.aspx#item-8. The Better Business Bureau: http://www.bbb.org. Posted in Strategic Partners, Trade Finance | Tagged escrow services, Strategic Partnerships, trade finance guide | Comments Off on How Are Escrow Services Used In International Trade Transactions? Bob McEntire and Barbara Banas are International Trade Specialists in the International Trade Administration’s Office of Strategic Partnerships. A record number of American businesses are now exporting, but there are so many others that could be selling their products and services overseas. Many that are currently exporting could be exporting to even more markets. Here at the International Trade Administration, we work directly with businesses all over the country to help them start exporting or increase exports. One key tool in our mission to help U.S. companies compete abroad is our Strategic Partnerships Program. This Program is a public/private partnership through which we work with some of America’s leading companies to promote exports. These companies help ITA get the word out about our services, and our partners get some extra subject matter expertise in the field of exporting. It’s a win-win for all the organizations involved, and it helps support the President’s National Export Initiative goal to double U.S. exports by the end of 2014. These partnerships are especially important during World Trade Month, when we take the opportunity to recognize the success that comes from them. All of our partners are helping support the U.S. economy and we appreciate the success stories they’re sharing, like this one from UPS. In the near future, we’ll bring you more news from our partners as we all cooperate to increase American exports and help shape America’s economy of the future – one in which even more of our businesses are tapping markets overseas and supporting jobs here at home. We are always looking for more strategic partners. Please let us know if your business would like to work with us. 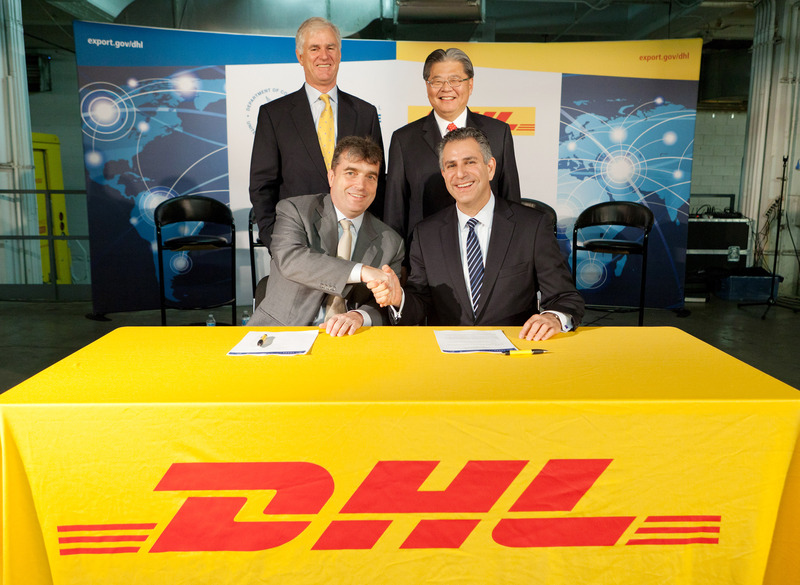 Under Secretary Sanchez and 3 DHL CEOs make ITA and DHL’s new partnership official at an MOU signing ceremony in New York City. As part of the Initiative, USIIC will refer Indian companies in search of new technologies or alternative sources of supply to the USFCS who will then connect India’s company directly to US businesses who can meet their needs. India is a key trading partner and US businesses – especially in aerospace, healthcare and medical devices, education, construction services, energy and environment, information and communication technology, textiles, defense and security and export facilitation services should consider expanding to the region. 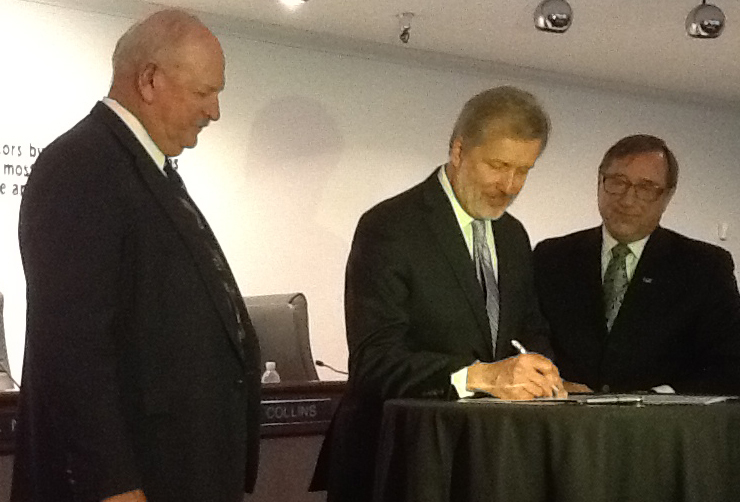 And our work with the USIIC is just one example of how our partners are helping US businesses grow their exports. 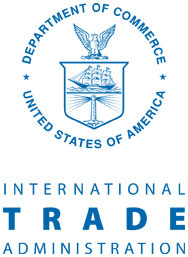 As part of the National Export Initiative, the International Trade Administration has focused on utilizing the expertise of the private sector, trade associations and state and local organizations to increase our effectiveness and reach more small businesses. Each organization plays an important role to increase US exports and create jobs here in America. Over the last year, our partnership program here at ITA has grown from 15 to more than 122. Together our partners, large multinational companies like UPS, FedEx and DHL, to trade associations like the National Association of Manufactures and National Marine Manufacturers’ Association, to state and local organizations like the Pasco Economic Development Council, have helped us reach tens of thousands of small business owners and connect some directly to business opportunities. If your organization would like to work the ITA please send us an email. Bob McEntire is a Senior Strategic Partnership Manager within the Office of Strategic Partnerships at the U.S Commercial Service. On May 9, 2012, the Commerce Department and DHL Express announced they have partnered to help small and mid-size businesses harness new international sales opportunities in the global marketplace. The partnership combines the Department of Commerce’s global reach and staff’s extensive knowledge of foreign trade with DHL’s proven international expertise and expansive U.S. customer base. This joint effort will provide U.S. companies easier access to comprehensive export assistance and will help stimulate job growth in the small and mid-size business sector. The partnership is a key component of the ITA’s leadership in implementing President Obama’s National Export Initiative (NEI), which aims to double U.S. exports by the end of 2014 in support of U.S. jobs. The Strategic Partnership Program is actively pursuing additional partnerships with US companies and associations. If interested in learning more about becoming a partner of the Commercial Service please visit the Strategic Partnership page.